"Deposit Bag 14'' X 20'' SafeLok, clear vertical twin" product is already in your cart. 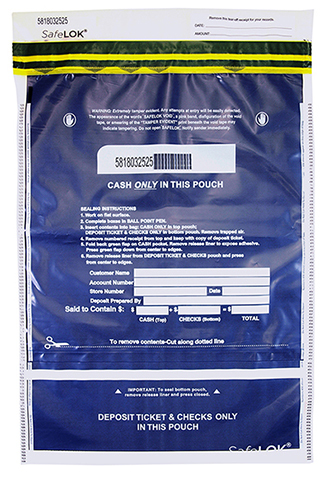 This 14" x 20" SafeLok vertical dual deposit bag available in high performance clear film, includes two pouches. One pouch for cash deposits, and another most commonly used for checks and deposit tickets. The 14? x 20? dual deposit bag has anti-static metalized release liner, and all seams meet all Federal Reserve guidelines. This ?easy seal? deposit bag is a favorite for high volume cash users.